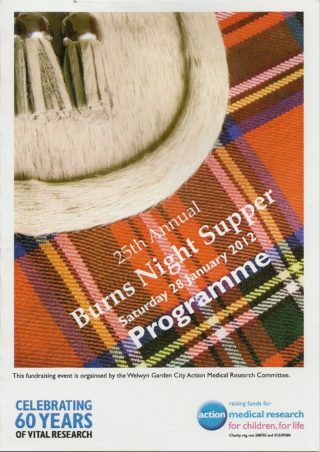 Since 1984, the Welwyn Garden City Committee for Action Medical Research has held an annual Burns Night Supper to celebrate the immortal bard and raise money for Action Medical Research. A total of £36,000 has been raised to 2012 and the event continues to be an annual event on the Welwyn Garden City social calendar. The event which takes place in a local school, currently Stanborough School, follows the traditional Burns Supper approach with a piper opening the event; addressing of the haggis; a traditional meal of haggis, neeps and tatties; speeches to the immortal memory and traditional dancing led by the local Strathgade ceilidh group. This page was added on 03/03/2012. January 2014 was the last Burns Supper to be organised by the Action Medical Research group in Welwyn Garden City.